For the fictional city from the Dragon Age series, see Dragon Age II. The town is first mentioned in Orkneyinga saga in the year 1046 when it is recorded as the residence of Rögnvald Brusason the Earl of Orkney, who was killed by his uncle Thorfinn the Mighty. In 1486, King James III of Scotland elevated Kirkwall to the status of a royal burgh. On the west edge of the town, surrounded by Hatston Industrial Estate, is a prehistoric ancient monument, Grain Earth House (Historic Scotland), a short low stone-walled passage deep underground leading to a small pillared chamber. This is the form of earth house or souterrain characteristic of the Northern Isles (although Grain is unusually deep below ground). It was originally connected to a surface dwelling, which has since disappeared, and the original purpose of these Iron Age structures remains unknown. Further west towards Grimbister is the similar Rennibister Earth House. Kirkwall is the administrative centre for Orkney, and is the home of headquarters for Orkney Islands Council and NHS Orkney. 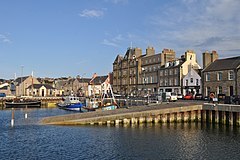 Kirkwall was a parliamentary burgh, combined with Dingwall, Dornoch, Tain and Wick in the Northern Burghs constituency of the House of Commons of the Parliament of Great Britain from 1708 to 1801 and of the Parliament of the United Kingdom from 1801 to 1918. Cromarty was added to the list in 1832. The constituency was a district of burghs known also as the Tain Burghs until 1832, and then as the Wick Burghs. It was represented by one Member of Parliament until 1918, when the constituency was abolished and the Kirkwall component was merged into the county constituency of Orkney and Shetland. Modern roadsigns still indicate "The City and Royal Burgh of Kirkwall", although Kirkwall is not an official Scottish city. In 1784–85 the well-known outspoken Liberal Charles James Fox represented Tain in the British Parliament, while his political opponents fiercely contested his having been elected in his usual constituency of Westminster; for this purpose, Fox was made an unlikely burgess of Kirkwall. Kirkwall is 130 miles (210 km) north of Aberdeen and 528 miles (850 km) north of London. 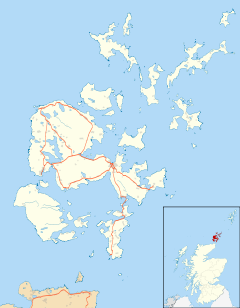 It is situated on the northern coast of Mainland Orkney with its harbours in the bay of Kirkwall to the north, and with Scapa Flow 1.4 miles (2 km) to the south. Its parish, St Ola forms the isthmus between Firth and Holm. It is the most populous island settlement in Scotland. As with the rest of Scotland, Kirkwall experiences a maritime climate with cool summers, mild winters, often strong winds, plentiful rainfall, frequently overcast skies and sparse amounts of sunshine. The population was 9,293 in 2011. The population was predicted to be about 10,000 in 2018. Kirkwall harbour with nearly 1 kilometre (0.6 mi) of quay edge is the second commercial hub for Orkney after Hatston. There is a Marina, and support for fishing and dive vessels. After extensive work on harbour facilities, the town has become a popular cruise ship stop, with several ships arriving each week in the season. This has added to the prosperity of the town and allowed a thriving sector of independently owned shops. Each year now, 140 cruise ships visit Kirkwall and Stromness. The Orkney Library and Archive is in Kirkwall. Kirkwall also has the most northerly of the world's Carnegie libraries, which was opened by Andrew Carnegie and his wife in 1909. The building survives, although the library has since moved to a larger building on Junction Road. The town has two museums, the larger being Tankerness House Museum, which contains items of local historical interest within one of Scotland's best-preserved 16th-century town-houses. It is a Category A listed building Scotland. The prehistoric, Pictish and Viking collections are of international importance. The other museum is the Orkney Wireless Museum, dealing with the history of radio and recorded sound. There is a Royal National Lifeboat Institution lifeboat station. One of the major annual events in the town is the Ba Game, held each Christmas Day and New Year's Day between the Uppies and the Doonies, each team representing one half of the town. The composer Peter Maxwell Davies was among a group which founded the annual St Magnus International Festival which is centred on Kirkwall each midsummer. Orkney Theatre, a 384 seat venue, was opened in 2014 next to Kirkwall Grammar School in The Meadows. It has an orchestra pit which can be made available for use by removing two rows of seats. Kirkwall Harbour can be seen in The Highlands and Islands – A Royal Tour, a 1973 documentary about Prince Charles' visit to the Highlands and Islands, directed by Oscar Marzaroli. Scottish film-maker Margaret Tait was born in Kirkwall, and many of her films (in particular the Aspects of Kirkwall series) are set there. Kirkwall has many 17th–18th-century houses and other structures in the local vernacular style. Kirkwall also once had a medieval castle, which was destroyed in the 17th century. Kirkwall is a port with ferry services to Aberdeen and Lerwick, as well as the principal north islands in the group. Hatson pier, the main ferry terminal, is some 2 miles (3.2 km) outside the town centre. The Aberdeen, Leith, Clyde & Tay Shipping Company operated steamer services to Kirkwall from 1836, with successor companies operating until 2002. Kirkwall Airport, the main airport for Orkney, is 2.5 miles (4.0 km) southeast of the town. There are no passenger rail services in Kirkwall, the nearby railways having been industrial or military. Kirkwall Grammar School has been established since circa 1200. The current school building was opened in 2014. Robert Gordon University (RGU) in Aberdeen started a research project in 2018 into the history of Orkney Tweed as part of a wider Orkney Project which is using the archives in Kirkwall. The 'Kirk' of Kirkwall was not the Cathedral (which was originally at Birsay), but the 11th-century church of Saint Olaf of Norway. One late medieval doorway survives from this church, and an aumbry from the original church survives within the late 19th-century structure of the present-day Saint Olaf's Church (Episcopal) in the town's Dundas Crescent. At the heart of the town stands St. Magnus Cathedral, which was founded in memory of Saint Magnus Erlendsson, Earl of Orkney 1108–1117 by Earl (later Saint) Rögnvald Kali. Next to the Cathedral are the ruins of the former Bishop's Palace and Earl's Palace. 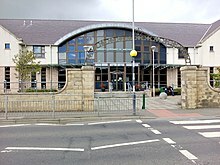 The Pickaquoy Centre, Orkney’s largest leisure centre, is located in Kirkwall. It contains two pools, an indoor sports arena, squash courts, climbing wall, athletics track, synthetic and grass pitches and various exercise/gym studios. Kirkwall Grammar School Sports Centre has indoor sports facilities, and grass and synthetic pitches, available to the public. Stanley Cursiter Painter and Limner, was born in East Road. Clara, Mrs Williams (nee Clara Anne Rendall), born Kirkwall 24 July 1887 , missionary, teacher, and wife of Rev. Aeneas Francon Williams was awarded the Kaisar-i-Hind medal in 1946 for her work during WWII being in-charge of Red Cross work in Dooars, Bengal, India. The Simpsons character Groundskeeper Willie is said to be from Kirkwall. ^ "Scotslanguage.com - Names in Scots - Places in Scotland". ^ "Kirkwall 1981–2010 averages". UKMO. Archived from the original on 7 October 2012. Retrieved 13 September 2012. ^ "Kirkwall Extremes". KNMI. Archived from the original on 22 February 2013. Retrieved 3 November 2011. ^ Valor, G. Ballester. "Synop report summary". www.ogimet.com. ^ "Kirkwall Port". Orkney Islands Council Harbour Authority. ^ "Cruise Ships". Orkney Islands Council Harbour Authority. Retrieved 2017-09-12. ^ "Kirkwall Lifeboat called out to fishing vessel - The Orcadian Online". 2 March 2017. ^ "St Magnus International Festival - Orkney's midsummer celebration of music and the arts". www.stmagnusfestival.com. ^ "Full record for 'Highlands and Islands – A Royal Tour'" Scottish Screen Archive. Retrieved 21 June 2010. ^ "Kirkwall (Hatston) Ferry Terminal - NorthLink Ferries". www.northlinkferries.co.uk. ^ "Trains to & from Orkney and Shetland - ScotRail". www.scotrail.co.uk. ^ "About KGS". Kirkwall Grammar School. ^ "Kirkwall Grammar School officially opened - The Orcadian Online". 17 June 2014. ^ "Tweed researchers are Orkney-bound — and they need your help - The Orcadian Online". 24 January 2018. ^ "KGS Sports Centre". www.orkney.gov.uk. ^ "Biographical Index of Former Fellows of The Royal Society of Edinburgh, 1783–2002" (PDF). The Royal Society of Edinburgh. July 2006. Retrieved 2018-08-19. ^ Lanepin (25 January 2016). be.com/watch?v=UQHpCBEIFMA "Groundskeeper Willie Compilation" Check |url= value (help) – via YouTube. Wikimedia Commons has media related to Kirkwall. Wikivoyage has a travel guide for Kirkwall.